﻿ Best Price on Hotel Tower House Suites in Panama City + Reviews! Just a 5-minute walk from Panama City’s financial district, Hotel Tower House Suites offers a roof terrace with a swimming pool and fantastic city views. The stylish air-conditioned rooms include free Wi-Fi. Each spacious room at the Tower House Suites offer bright contemporary décor and views of the city. All rooms include flat-screen cable TV, a mini-bar, a safe and a modern bathroom with free toiletries. A free American breakfast is served daily and the bar-restaurant offers international cuisine. You can also find a range of restaurants, cafés and lively bars on Uruguay Street, just 164 feet away. 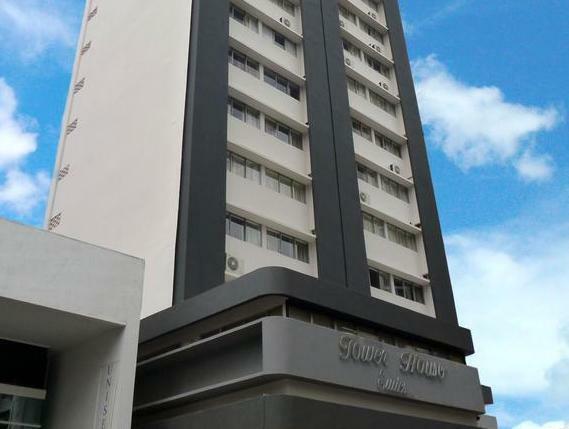 Tower House Suites is a 10-minute walk from Balboa Avenue and the seafront. Albrook Shopping Center and Albrook Airport are 3.7 mi away, while Tocumen International Airport is 14 mi away. Free parking is provided. I stayed in the Hotel Tower House Suites after experiencing a nightmare situation at another hotel, and was glad I did so. The room was a good size with a small kitchenette, clean, and the AC was an amazing escape from the Panama weather. Would go back to Hotel Tower House Suites next time I'm in Panama City.